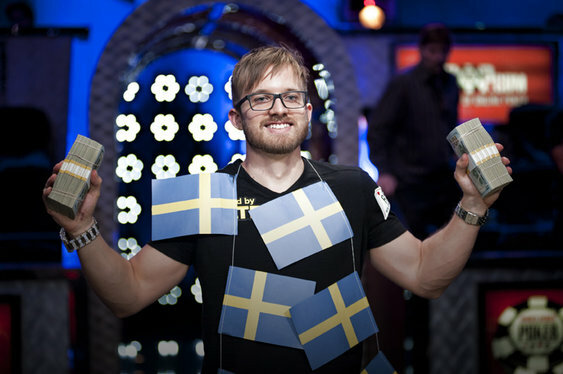 He was tipped by many to do well at this year's final table despite being one of the shortest stacks and in the early hours of this morning Sweden's Martin Jacobson finally clinched the WSOP Main Event title. Following an impressive display on Monday, Jacobson, who is well-known on the European circuit, managed to come from behind and clinch the poker world's most coveted bracelet. Last night's final session began with Jorryt van Hoof leading the way thanks to a dominant performance on Monday. The Dutch pro has used his chip lead throughout the day to bully his opponents into submission and managed to make it through the session with more than 20 million chips than his closest rival, Jacobson. However, when the all European finale got under way last night, it was Jacobson who quickly took control, first edging his way closer to van Hoof before sending him to the rail in an As Tc vs. Ad 5d coup. Jacobson's elimination of van Hoof proved to be the decisive moment in the match as it not only put him firmly in control of proceedings, but gave him the momentum to dispatch Felix Stephensen in a matter of minutes: 45 minutes to be precise. Holding almost a 3:1 chip lead, Jacobson gradually squeezed his Norwegian opponent until he eventually took a stand with Ah 9h. On most occasions that hand would have been in decent shape heads-up, but as Jacobson revealed pocket tens (ironically it's the 10th anniversary of the WSOP at the Rio and the top prize was $10 million) the writing was virtually on the wall. As the final board rolled out 3s 9c Tc Kd 4c, an elated Jacobson was mobbed by his friends and family while Stephensen stood and pondered what could have been. As the confetti rained down on the latest WSOP World Champion, Jacobson, he explained that he was always confident that he could come from behind and win. "It is surreal. I have been so focused the past couple days. I felt comfortable and surprisingly calm. I don’t know, it just felt like it was meant to be." After the interviews were done, Jacobson was presented with his first ever WSOP bracelet as well as this year's top prize of $10 million. Image courtesy of Drew Amato / Bluff.com.